GALION — The Galion High School cross country is collecting shoes to raise money to help send the kids to cross country camp. The team has been collecting since June 1 and so far have managed to get have 79 bags (25 pair in each bag) of shoes. We collect a bunch and then get together to tie or rubber band them together. The team is working with a company called Funds2org. They will pay us for the shoes the team collects. Shoes can be dropped off from 9 a.m. to noon Monday through Friday at GracePoint Church; Mid Ohio Motorsports during regular business hours; from 9 a.m. to 2 p.m. Monday through Friday at Galion High School and at the Galion YMCA during regular business hours. It is helpful if tennis shoes and boots can be tied together with the shoe strings ahead of time. Courtesy photo The Galion High School cross country is collecting shoes to raise money to help send the kids to cross country camp. The team has been collecting since June 1 and so far have managed to get have 79 bags (25 pair in each bag) of shoes. We collect a bunch and then get together to tie or rubber band them together. The team is working with a company called Funds2org. They will pay us for the shoes the team collects. Shoes can be dropped off from 9 a.m. to noon Monday through Friday at GracePoint Church; Mid Ohio Motorsports during regular business hours; from 9 a.m. to 2 p.m. Monday through Friday at Galion High School and at the Galion YMCA during regular business hours. It is helpful if tennis shoes and boots can be tied together with the shoe strings ahead of time. 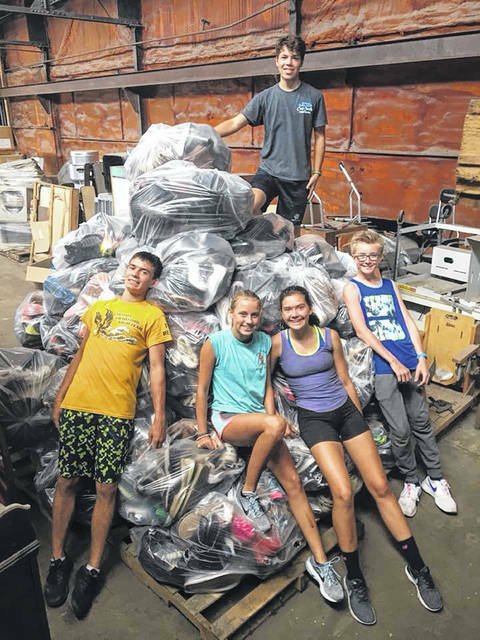 https://www.galioninquirer.com/wp-content/uploads/sites/38/2018/07/web1_Galion-XC-Shoe-Roundup.jpgCourtesy photo The Galion High School cross country is collecting shoes to raise money to help send the kids to cross country camp. The team has been collecting since June 1 and so far have managed to get have 79 bags (25 pair in each bag) of shoes. We collect a bunch and then get together to tie or rubber band them together. The team is working with a company called Funds2org. They will pay us for the shoes the team collects. Shoes can be dropped off from 9 a.m. to noon Monday through Friday at GracePoint Church; Mid Ohio Motorsports during regular business hours; from 9 a.m. to 2 p.m. Monday through Friday at Galion High School and at the Galion YMCA during regular business hours. It is helpful if tennis shoes and boots can be tied together with the shoe strings ahead of time.